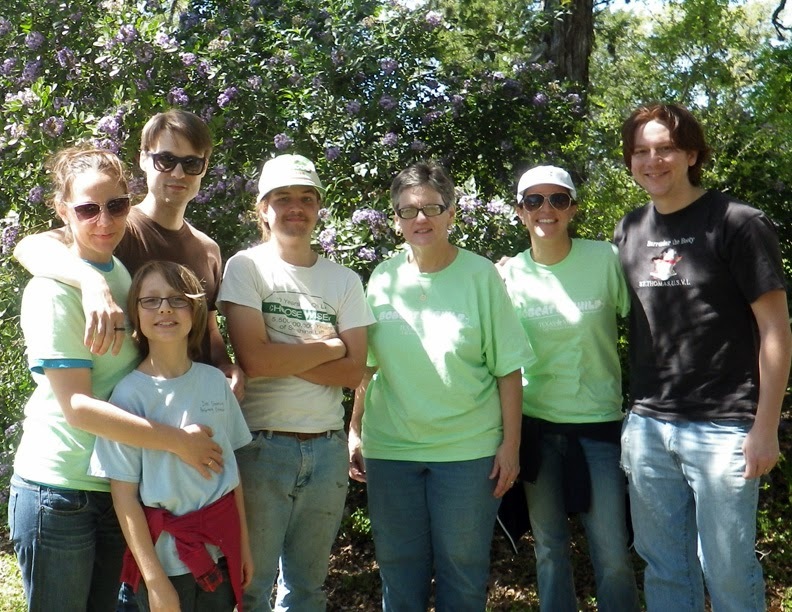 The Thursday trail crew regulars culminated two workdays’ effort at removing the invasive ligustrum from Prospect Park on March 28th. With help from Susan Hanson’s Honors English Composition class and a group of Bobcat Theater Majors the cut trees were moved and spread to stem the flow of rainwater down the hill. Limbo Loop is opened to planting native plants similar to what has been done along Virgil’s Way and the karst features. The plan is to encourage mountain laurel to dominate the hillside below the Westover neighborhood. Wildflowers were also planted, hopefully to appear next Spring. The mountain laurel is expected to take a few years longer. The bois d’arc and Mexican plum trees planted years ago were weeded, given a new mulch bed and new or repaired deer fencing. Years from now the trees are expected to shade the trail and provide a visual interest to the meadow with their unusual fruit. The student volunteers also hauled a number of ligustrum trees and branches to a staging area next to Limbo Loop in preparation for a needed trail re-route. In the ‘dry’ wetlands pond Devil’s Claw was planted to the bare sides in an attempt to grow vegetation.